Ice is from Suprise’s first litter, his mother is IC GB*Hindarfiall Vardrun. He has only been shown a few time but achieved best in show kitten at Worthing in August 2005 and was beaten for best in category 2 by his father!! 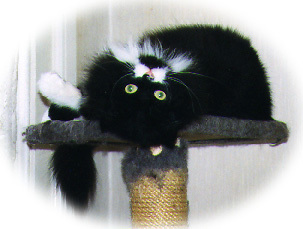 Merlin is a recent (and much loved) addition to the Hindarfiall Cattery….and yes another black and white. I have been watching this boy grow since he was first-born. He has really settled into the house and has a delightful, affectionate personality. He will be our third show neuter and eventually be shown abroad. His first show was in April where he obtained EX1. He went to his second show at Northallerton and obtained EX1 and BIV. Many thanks to Mel and Neil Gardner from the Kjaerligkatt cattery for entrusting us with this superb boy. In January 2002 ‘Keo’ became the FIRST Norwegian Forest Cat in the UK to achieve PREMIER status within both GCCF and CA (FIFE). Well done Keo! Our first NFC. We love him to bits and he has been successful at many shows. In June 1997 the Norwegian breed reached Championship status and since then he has reached further heights by winning five Premier Certificates and became a Premier Champion in July 1998. In October 1999 he was awarded a Reserve Grand Certificate and obtained a second Reserve Grand Certificate in January 2000. He has been to CA shows which he has loved. I am very realistic with my cats and I know that he does not have the quality to go far but he loves going to shows and eventually he will go along for the day to keep the others company. Keo obtained his International Premier title on 10th March 2002. Moley is a much loved addition to our family. She was quite successful on the show bench as a kitten: out of 6 shows she obtained three firsts, one second and one third but as she grew into an adult her features changed a lot. The name ‘Moley’ has stuck since her birth as she resembled a mole! Unfortunately she does not reach the required standard for the Norwegian Forest Cat but she is very happy being a house cat and she loves kittens being around and is like a second mum – we love her.